Soupergirl is Sara Polon, a former stand up comedienne turned soup-maker. After reading Michael Pollan’s book, the Omnivore’s Dilemma, Sara decided to get involved in the local food movement. She thought about being a farmer but she can’t even keep her house plants alive. Soupermom is Marilyn Polon. She’s a home taught master in the kitchen. She raised the Polon kids on natural, freshly cooked and delicious food. 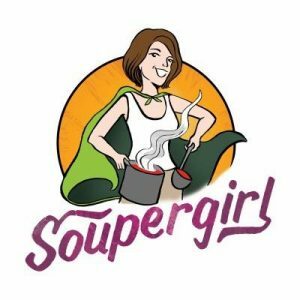 Soupermom, aka the Chief Anxiety Officer, and Soupergirl teamed up to bring locally inspired, nutritious, and delicious soup to the hungry citizens of Washington, DC and beyond. Jan 19, 2017: Sara Polon started her soup business with her mother. Now it’s overflowing. Sara Polon launched Soupergirl in December 2008. Soupergirl prepares and distributes vegan soups made with locally sourced ingredients in the DC area via their Takoma storefront and booming soup delivery business. Sara and Soupergirl won the 2009 WJF Business Plan DC Prize. WJF’s Sarah Wester sat down to talk soup with Sara at her Takoma storefront recently. There is an incredible burgeoning local food movement in the DC area, and a lot of people want to be involved. But DC is a busy town, and people work long, hard hours. They go to a market and pick up kale and beets, which end up rotting in the fridge because nobody has time to cook. Soupergirl is bridging the gap between farmers and consumers. We’ll get the local food for you. We’ll cook it for you. You just have to eat it! How did you become interested in this problem? I read “The Omnivore’s Dilemma” by Michael Pollan and that became my bible. I was so impressed with the local food movement and the impact it could have on health, the community, and the planet, and I was inspired. That was the heart of the business. I wanted to be involved in the local food movement in DC and spread it as much as possible. At Soupergirl, we incorporate local food whenever possible. We cook seasonally, we cook locally, we source responsibly, and we stay true to our vision. Presently we are selling our soup at three different farmers markets, via our delivery service, and via our storefront. We’re constantly growing, and considering expanding into wholesale. We’re trying to get this product, that is made as responsibly and sustainably as possible, out to as many consumers as possible. Has the William James Foundation competition and mentoring program helped you on your way? I started Soupergirl with a very extensive to-do list that 4 years later I still haven’t completed. [The WJF competition] forced me to finish a business plan, and run the financials completely for Soupergirl. The feedback [from WJF judges] was fantastic, and helped reveal where I could save money, and where I had growth potential. What other resources have you found that are particularly useful for social entrepreneurs in DC? FRESHFARM Markets has been incredible for me. They provide support, connections, and ideas. For readers who want to know more about what you’re up to, where can we send them? Also, our Facebook page frequently features news and updates from Soupergirl. Anything else you’d like the William James Foundation community to know?